My Rudy is now 1 yr 5 months and he is the joy of my life. He is so happy and loves to go to the lake. He will not leave my side even off the leash and even if other people are around and other dogs. He is so loyal. I named him Rudy after the movie "Rudy" because he came from South Bend, Indiana near Notre Dame. His one eye just has a little pigment not all the way around but it is still coming in after all this time. He definitely is the Anti-Depressive dog. I think he should be on TV, he's adorable!. what a cute boy! He is such a cute and good baby. Love to see his face. 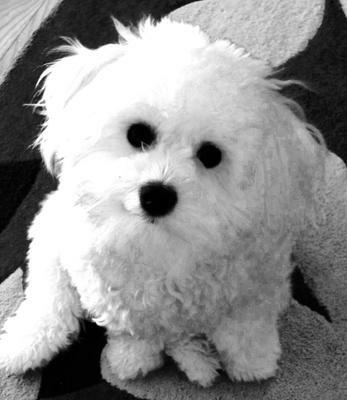 We named our Coton Rudy as well. It is short for Rudolph. We had a hard time agreeing on a name and Rudolph the red nose reindeer popped into my mind and I suggested Rudolph and then Rudy was agreed on. He is the love of my life and always has to be by my side. He leaves whoever he is next to when I come into the room. He is 3 years old and the sweetest thing ever.